Crafting Process Die Casting, Scrubbing, Finishing & Painting. Beautiful Gandhi Pocket watch for your daily use. Happy Shopping at Interio Crafts. 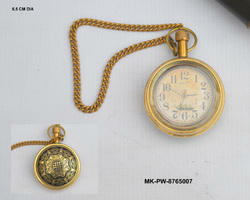 It is an antique look victoria london pocket chain watch which is unique and made of pure brass. The orb pocket watch is a skeleton style with a clear back that allows you to see the inter workings of the piece. The pendant is suspended from a antique brass chain that compliments the piece perfectly. Great conversation piece and a fun gift for all wizard lovers. Inspired by our clients we have now started to manufacture and supply a wide array of Pocket Watch. Available in different colors, shapes, sizes and finishes, these are of high utility in office and corporate sector and known for their unique features such as smooth texture, classic design and durability. Available in three sizes : 28.5mm Round, 35.5mm Round & 41mm Round. 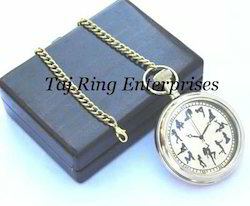 This is Beautiful Antique Pocket Watch With Long Chain. This Nautical Pocket Watch finish is antique finish. This is beautiful Pocket Watch Engraved With " VICTORIA LONDON 1876 ". It is made of brass & face glass.